The genus Strix comprises a group of typical owls the members of which are medium-large owls that lack the ear tufts typically associated with owls. They feed on small mammals, birds and reptiles. 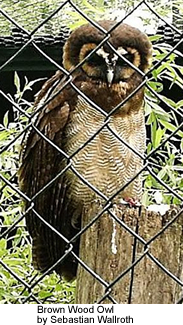 Mottled Wood Owl, Strix ocellata : A medium sized owl found in South Asia, where it inhabits in gardens and thin deciduous forests. They emit distinctive eerie laughing call of Chu hua-aa, with a quaver in the second note.